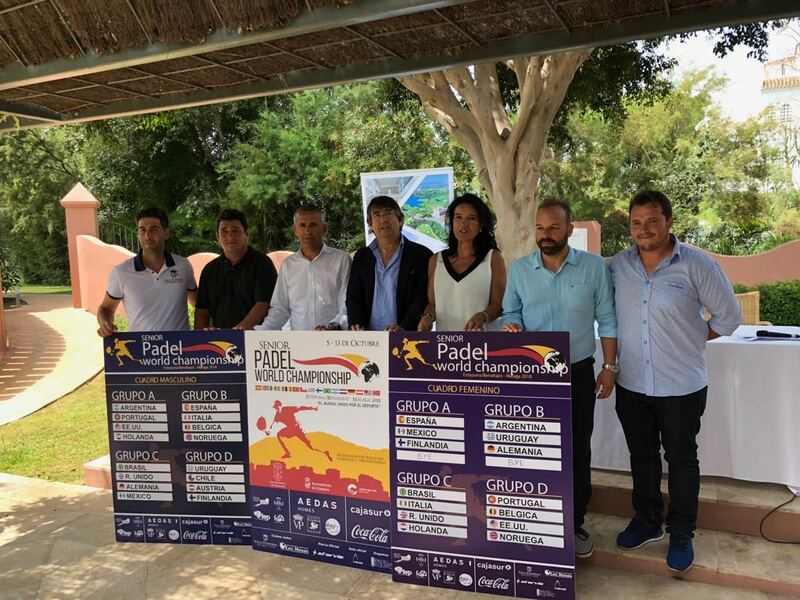 Estepona and Benahavís are getting ready to host the 1st Senior Padel World Championship with the following motto: “The world united by sports”. The Championship will take place in Club de Racquet Villa Padierna and at Centro Deportivo Las Mesas from the 5th to 13th of October. Last Saturday, 1st of September, the Senior Padel World Championship was officially presented. Several public personalities took part in the presentation such as the President of the Andalusian Padel Federation and Vice-president of the Spanish Federation, José Pérez García, the General Secretary of FIP, Francisco Javier Marín Cao, the mayor of Estepona, José María García Urbano, the Sports councillor of Benahavís, Alonso Mena, the organising company of that event “Padel en Equipo” represented by María José Campos and Alfonso Caballero. We also had with us a special guest who is Sergio Scariolo, current national coach of the Spanish Basketball team who wanted to show his support to the event itself and the cause “The world united by sports”. We also had around the companies supporting the event and the sponsors and partners, who we would like to thank: Ayuntamiento de Estepona, Ayuntamiento de Benahavís, Patronato de Turismo de la Costa del Sol, Aedas Home, Star Vie, Hotel Villa Padierna, Cajasur, Apartamentos Albayt Resort, Gran Hotel de Benahavís, Coca-Cola, Head. This is the first edition of the Championship that will have the world’s best players in the world representing a total of 16 countries that shows the outstanding international development of the sport. On Friday, the 5th of October, the Open phase will start counting on the open participation of all the senior pairs that would like to enjoy the experience of being part of a World Championship. Afterwards, we will announce the number of pairs that will be add into the ones that had already qualified by ranking. It is important to highlight that we had some media covering the event, federations, institutions and padel fans who wanted to witness the draw of the groups for both men and women categories, divided by 4 different groups organized by the leaders of each. The Spanish Federation (women category) will start facing Mexico and Finland. When it comes to the men, the will face Italy, Belgium and Norway. The 16 teams attending the Championship are: Great Britain, Uruguay, Spain, Germany, Mexico, Argentina, Austria, Finland, Brazil, Portugal, The Netherlands, Italy, Belgium, Chile, USA and Norway. 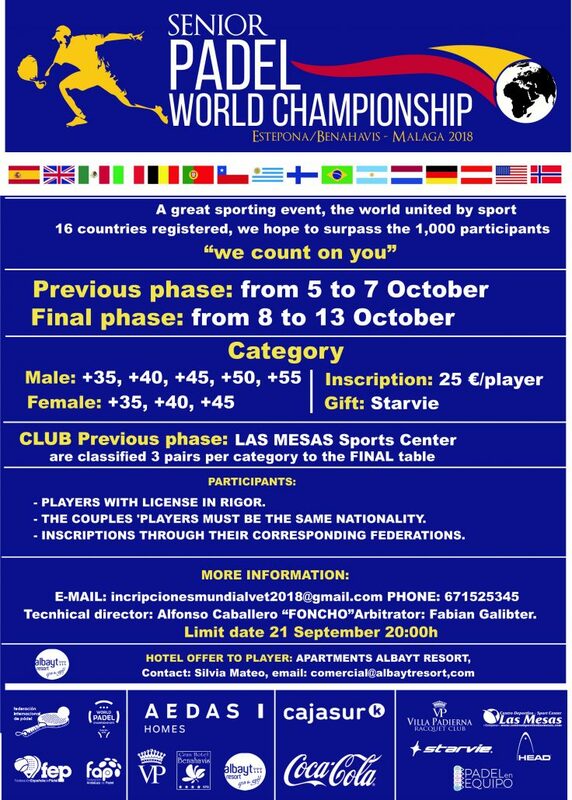 The company in charge of the organisation of the World Championship “Padel en Equipo” led by Gaspar&Campos and CD Sierra Morena, would like to -as they already did for the World Juniors Championship that took place in Málaga- that the philosophy of “The world united by sports” takes the lead internationally as a universal way of understanding union, friendshop and sportiness around the world. 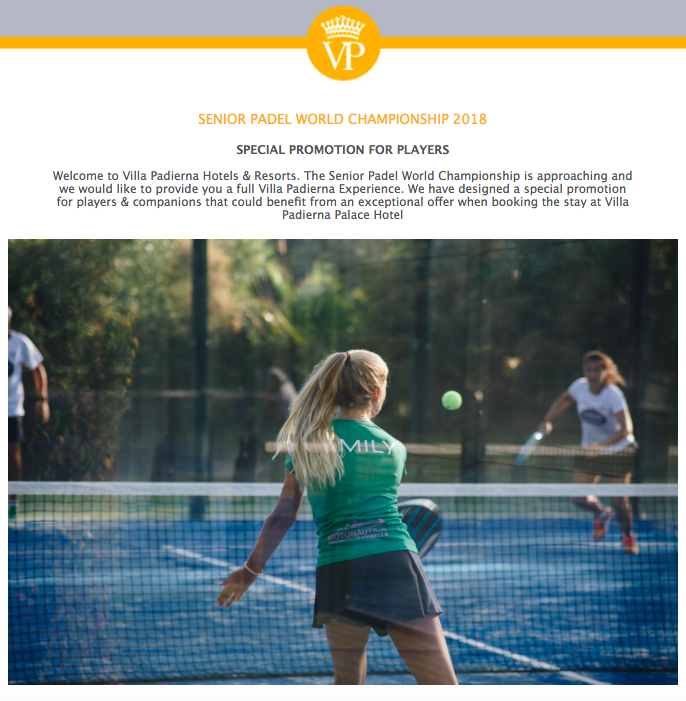 The first edition of the Senior Padel World Championship kicks-off on the 8th until the 13th of October in Estepona/Benahavís, Málaga (Spain). 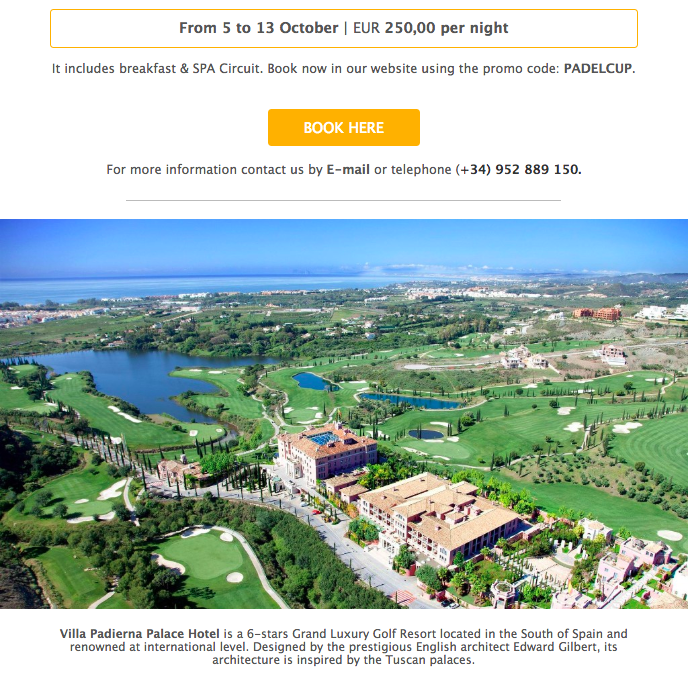 That is the reason why Villa Padierna Palace Hotel presents us a very special promotion for players & companions that could benefit from an exceptional offer when booking the stay to attend the Championship. You can also refer to this link. The 2018 Junior Pan-American Championship will take place in Caixas do Sul, Brasil from 21st to 24th of November. So far, several pairs have confirmed their participation in the Championship as follows: Argentina, Chile, USA, Mexico, Paraguay, Uruguay as well as the host country Brasil. Regarding the pre-registration system, please be aware that it is only valid if it is done through the National Federation only. Deadline is set for the 15th of September. For the information referring to national temas and national pairs selected, the deadline for that pre-registration will be on the 16th and 30th respectevily. In order to get more information about the rules, teams, ages of the participants, schedules, programme among other conditions, please follow the link: CAMPEONATO PANAMERICANO DE MENORES 2018. More details at www.cobrapa.com.br and www.padelfip.org, and you can also keep yourself updated via website and social media platforms. Important: Spanish players will have to register through any of these two platforms -either web or APP- on « Padel Manager ».  The organising committee will send these registrations to the Spanish Padel Federation (FEP) awaiting the data to be verified. When it comes to the registrations for players having their nationality from countries that are part of a Federation or National Association which are FIP members, they will have to confirm their participation through the corresponding federation in the first place. Once the registrations will be closed, each National Federation will have to inform FIP regarding the registrations that were received and authorised from the athletes of its nationality. The International Federation will be in charge of approving and publishing the official registration list afterwards. The South American Amateur Championship Chile stops in Club del Bosque (Reñaca), Bluepadel located in Viña del Mar from the 7th to 9th of December. National Federations will have to confirm their participation in either categories male, female or both, throughout their pre-registration until October the 1st at the latest. The oficial rules and regulations follow the code approved by FIP and all the information regarding the game system, accommodation, prizes among others, can be found here: FICHA TECNICA CAMPEONATO SUDAMERICANOAMATEUR 2018.